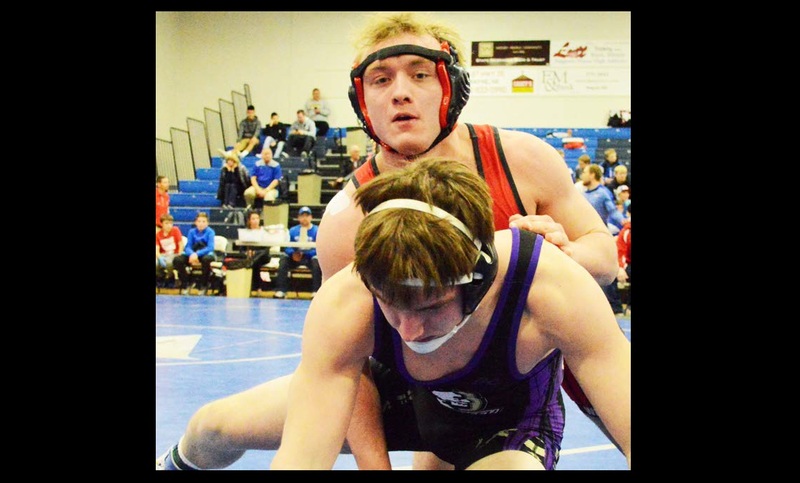 WAYNE — Three Cedar Catholic wrestlers were crowned last week as MidStates Conference champions. Turner Korth at 145, Morgan Koch at 160, and Eric Hoesing at 182 each became conference champions at their respective weight classes. It was the second Tournament in a row that three Cedar wrestlers earned first place finishes. As a team, Cedar Catholic placed third at the MidStates Conference Tournament on Thursday in Wayne, scoring 105 points. Battle Creek won the team title for the fourth consecutive year, and Pierce followed in second. Ethan Koch also made it to the first-place match, but he lost to Battle Creek’s Ty Heimes in a match that required two extra periods to decide. Bartling was proud at the success the team saw at the match. For Hoesing, he pinned Battle Creek’s AJ Hawthorne in the finals to win the 182-pound title. The Cedar junior had lost to Hawthorne earlier in the season, now the two have each won a match against each other and are set for a potential third matchup at Districts on Friday. “He beat us at Battle Creek. He threw us and stuck us in the first period. That is a kid we will face at Districts, and now we have beaten him so we are split and now that he knows we can beat that kid, Eric’s confidence will go through the roof,” Bartling said. For Ethan Koch, he could also see Heimes again on Friday. The two will be the top two seeds at 152 pounds, and battle for seeding at State in Omaha if they clash at Districts. Korth earned his championship over Norfolk Catholic’s Francisco Mendez, an opponent he has now beaten twice. Morgan Koch pinned Wayne’s Reid Korth in 1:10, to secure his first championship of the season at 160 pounds. At 126 pounds, Kerby Hochstein finished in third place, going 3-1 on the day. Hochstein was pinned by Pierce’s Carter Jensen in the semifinals, sending him to the consolation bracket. Hochstein rebounded by pinning both of his next opponents to end his day. The Trocats finishing in third place as a team is more impressive when considering the fact Cedar does not have a full team. Not once this season has Cedar Catholic filled all 14 weight classes, topping out with nine competitors at most. The third-place finish for Cedar Catholic sent the Trocats into the weekend with momentum. Cedar traveled to the Norfolk Catholic Invite on Saturday for the team’s final Invitational before competing at Districts this Friday in Battle Creek. 106 Carson Jones (9-25) place is unknown and scored 0.0 team points. 126 Kerby Hochstein (28-14) placed 3rd and scored 18.0 team points. 138 Conner Hochstein (6-21) place is unknown and scored 0.0 team points. 145 Cole Steffensen (7-14) place is unknown. 145 Turner Korth (33-7) placed 1st and scored 24.0 team points. 152 Ethan Koch (13-3) placed 2nd and scored 19.0 team points. 160 Morgan Koch (25-9) placed 1st and scored 22.0 team points. 182 Eric Hoesing (26-8) placed 1st and scored 22.0 team points.